Owen’s Aunt Erin and Uncle Patrick bought him a little red wagon for his first birthday. 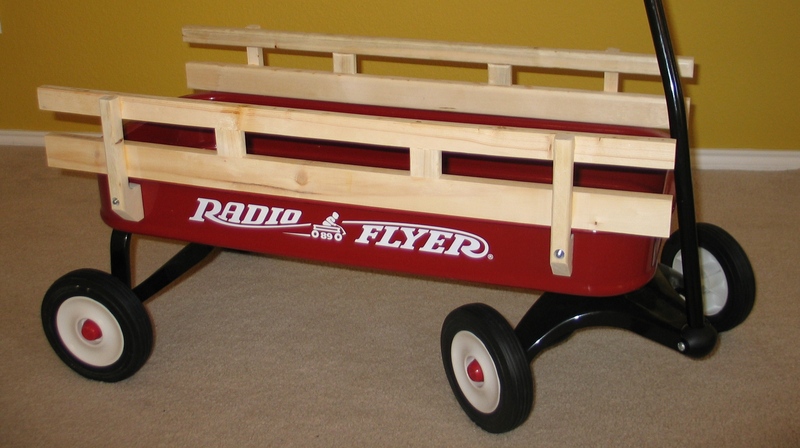 A Radio Flyer to be more specific, an American classic toy since the 1950’s. He’s been enjoying it a lot, putting his other toys in it and pulling or pushing it around the living room. The other day his friend L climbed in and Owen pushed him around in it. Too cute. The only issue with it is that when Owen sits in it and you begin to pull him around he sometimes falls over. Now don’t worry, he doesn’t fall out or anything, he just tips a bit and you have to keep reaching back to catch him or accelerate very slowly. We’ll have to keep doing this until he can grab hold of the sides and keep himself upright. Or, I can build higher side rails that are easier for him to grab and maybe even a back rail. Some other models of Radio Flyers come with these, but that’s not the one Owen got. This works out great as I love doing this kind of thing and this was just the excuse I needed to make some more dust in the garage, I mean shop. If you’ve read any of my previous posts on wood working, you know I didn’t buy anything for this project. The builders left plenty of material in my garage to keep me busy for awhile. There were about four or five boards for framing windows left that were 1”x4”x16’. 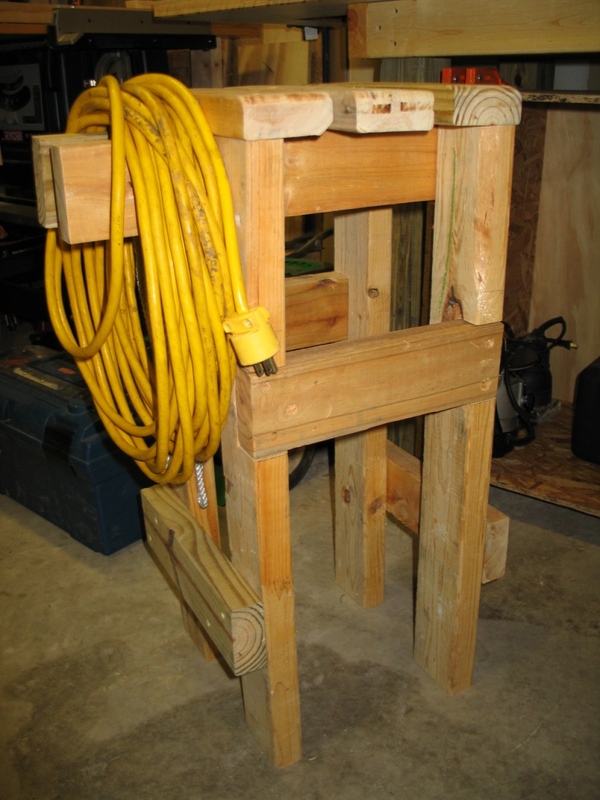 I used one of these previously to make some knock down saw horses. So I started by looking at many pictures online of the wagons with rails to get an idea of size and shape of the supports. They were simple enough, looking mostly like a “J”. Originally I was going to have three rails on each side, but this got narrowed down to two rails of equal size on each side. I was also originally going to have three “J” supports but this was taken down to two as I didn’t want to put one right in the middle of the Radio Flyer logo. With this I now made sketches of the “J” supports and side rails. I decided on two rails 2.25” tall and 34” long matching the length of the wagon. On the first rip cut of the rails, I was left with a piece 34”x1.125”. After looking at this and comparing it to the other rail of 2.25” I decided the contrast of the tall and short rails looked rather good together. I can’t describe it, but it just looked more appealing. Plus if I used this thinner piece instead of cutting another 2.25” tall rail I would be utilizing lots of otherwise scrap material. The mission creep on this one is off to roaring start, I have however saved myself a lot of time. With everything cut to size on the table saw, it was time to round all the inside edges so Owen and friends don’t get snagged on any sharp corners. 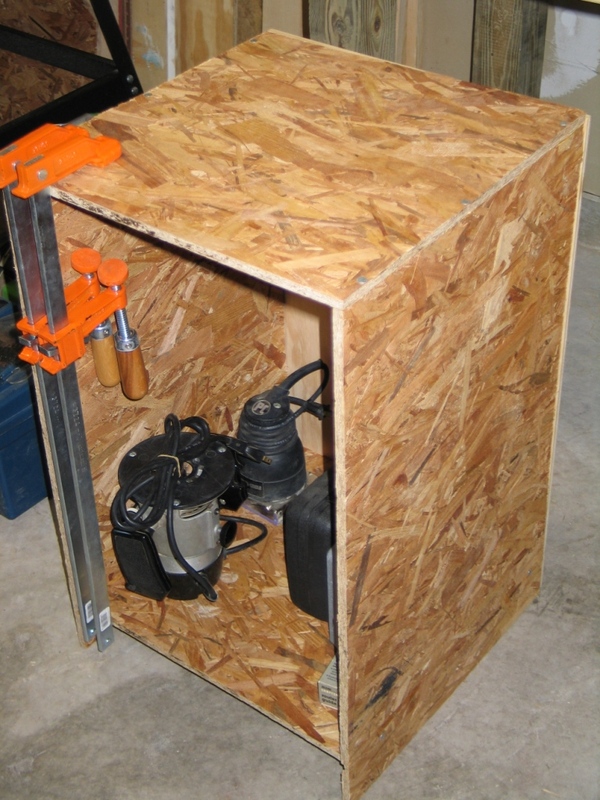 This was easy enough since I’d made a crude router table months ago. After that some sanding was in order. I married into a great Porter-Cable palm sander. 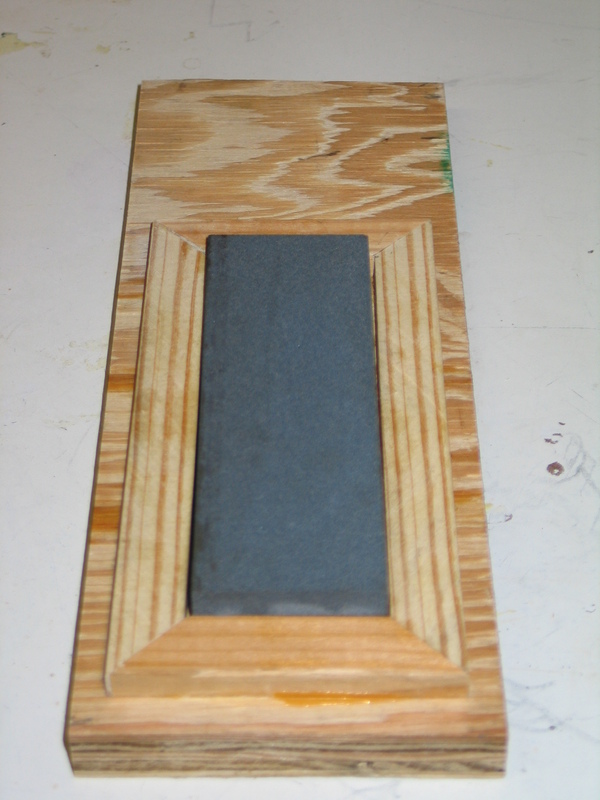 This works well if the objects sanded is stationary and dust collection is not an issue. It was hard to keep the sander in one hand, the hose from vacuum in the other, and hold the rail being sanded in my third hand. So I reversed everything. I flipped the sander over and clamped it in the wood vise along with the hose. This freed up both hands and I could easily swap from piece to piece to get this all sanded fairly quickly. With everything cut, routed, and sanded, all that was left was to drill a few holes, insert a couple dowels and glue everything up. After the glue dried, I had some small areas to clean up and then I could mount the rails on the wagon. I really needed 1.75” bolts, but the only hardware HD had was 2”. Now I have 0.25” sticking out and may need to cut off or cover with a rubber nut or something. Jess told me when Owen first saw the new rails he got really excited and liked them a lot. Wish I was home to see him. I hope he enjoys them and they don’t break off. I’ve really got to get some Oak or start dealing with harder woods as Owen gets older and can break things more easily. 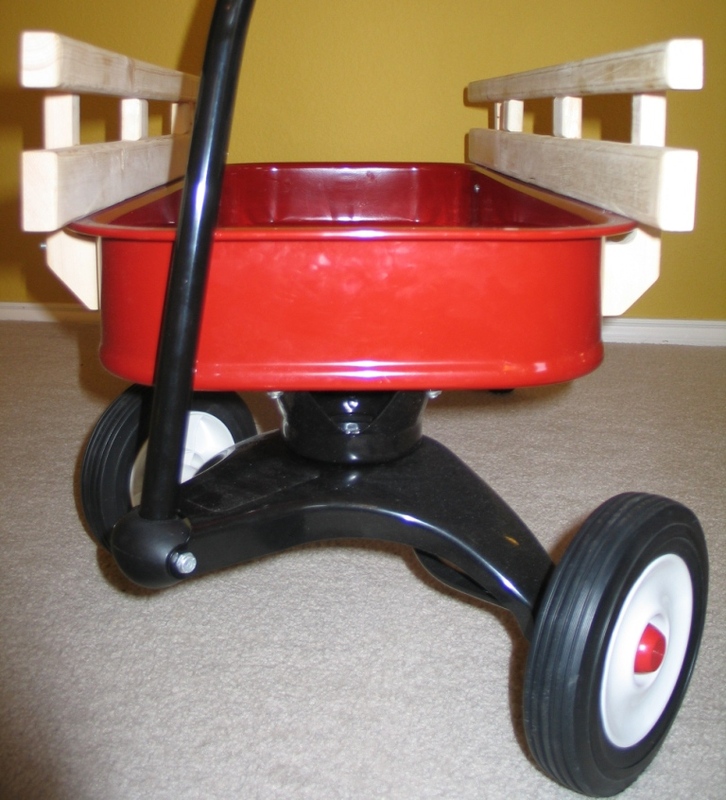 Does anybody have a memory of their little red wagon growing up? We’ all love to hear it. Home Depot offers a picnic table kit for $40 that comes with a prebuilt top and all the hardware. I would be hard pressed to get all those materials for that price, plus they’re pre-cut, so I’m saving time too. So the box claims “Average Construction Time = 60 mins.” Easy enough. Yeah, that doesn’t count the two coats of sealer it recommends prior to assembly. Lucky for me, my garage came complete with a barely used gallon of Bear water sealer. The can says it’s good on any wood and has a red oak flavor to it. This will go nice with the Southern Yellow Pine wood of the table. So that’s taken care of, and let’s see I’ll need a brush. Ah, here’s one. I used to use it to dust off the gas distributor in my grill, that’ll work. Now, I’m no Bob Ross, but I think a nice strawberry-blond with just a hint of black ash will make a nice picnic table color. The first photo is of the wood right out of the box. 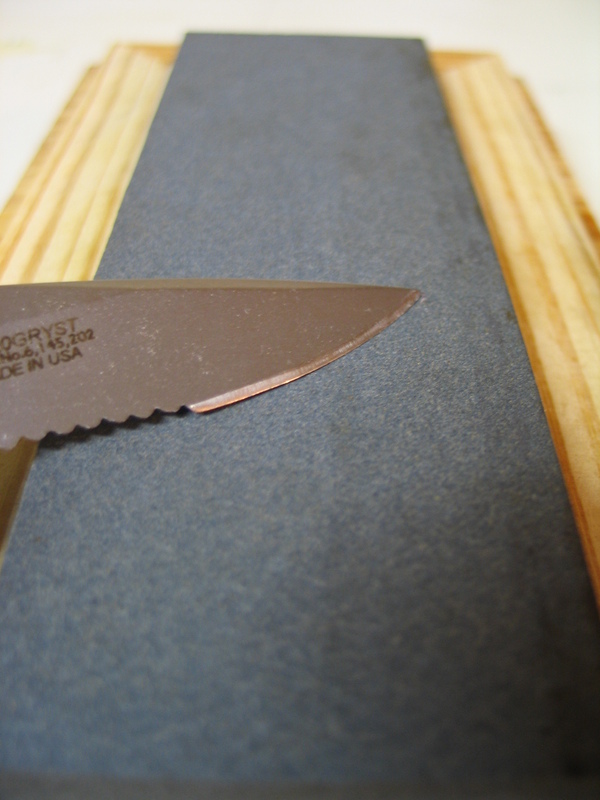 Wait, did you think you could just jump right into the staining and sealing? No. There is much sanding to be done. Gotta knock down some bumps and take all those nasty ink marks off the sides that will be facing up. All in all, it’s about 3 hours of labor sanding, sealing and resealing over three days. 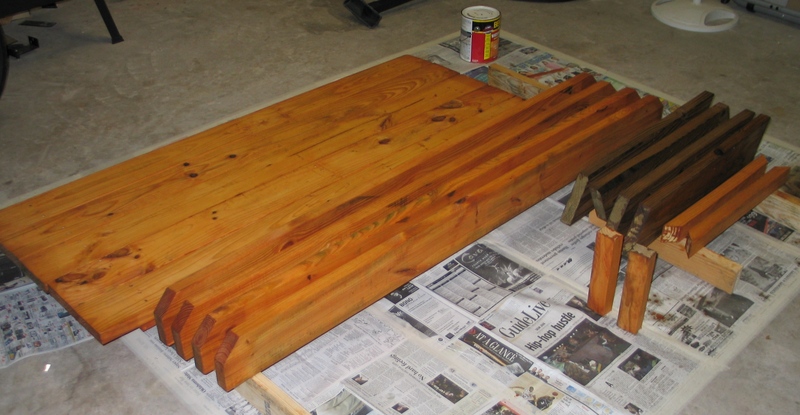 The second picture was taken after one coat of sealer. One more night and one more coat and we’re ready to begin the estimated “60 minutes” of assembly time. I guess it’s my fault for not reading the whole sign. This story gets interrupted by another project. Hanging the storm door. This will have to wait another day to finish as that’s the only day the neighbor helping me was available. Since becoming a homeowner, I’ve been trying to flex my handy-man muscles. So far, I think I’ve replaced a few light bulbs, attempted to patch a hole in the trim off the front of the house, and mended the fence, several times. Oh, and I did patch a hole in the guest shower. Not a lot, having lived here for nine months. This is not feeding my appetite for projects. “Appetite for projects, what’s wrong with you Josh? You should be so lucky to not have anything to repair, replace, or ‘re-buy’.” You don’t understand. Before moving to Texas, my job was to break stuff. Everyday, 8 hours a day, breaking stuff, with no outlet for building or constructing. This leaves an imbalance in the human psyche that needs attention. Granted, my new career doesn’t require me to break anything, not yet at least, [side note: I will begin testing of systems soon, and that may offer multiple opportunities to break stuff, you people who know me well, know what I’m capable of], but I still have five years of imbalance to catch up on. “When it rains, it pours,” right? I started out this weekend working on a toy truck I’m making for Owen’s first birthday. That’s all I had on my plate, so I thought I had all weekend to work on it. WRONG! Let’s go ahead and throw building a picnic table, installing a storm door, and cleaning the motorcycle. Don’t’ forget you still have to mow, edge, trim and still try to spend time with the family. Josh’s quote of the week, “Don’t start ‘Weekend Projects’ on Sunday.” They’re not getting done. I’m gonna go off on the picnic table later, not exactly ‘as advertised.’ And the storm door will hopefully be installed Tuesday, I conned a neighbor into helping with this. He claims to have done it before, so I have high expectations. So I’ve spread all this out over a week. But that’s all I get. Owen’s party is this weekend, and naturally, all this must be done by then. I’ll have some pictures of all this as each project gets done. Months ago, a friend unloaded a work table from his garage he no longer wanted. It was all wafer board top with 2×4 legs and supports. I already had a work bench so I didn’t need it, but I’m not one to turn down free wood. So for about the first week it lived in the “shop”, it remained a table until I could really get to it. I hacked it up nice and removed all the hardware he had stuck in it. Now with all this material, I needed something to build. By this time, I tired of always having to stand in front of my work bench. So I decided a stool would be perfect. 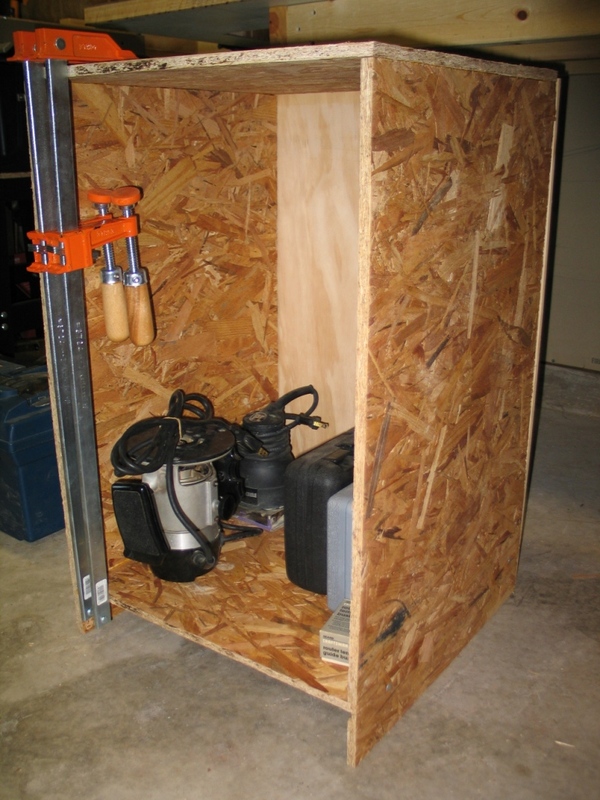 I drew up some plans and made sure that when complete it would fit under the work bench out of the way when not in use. I had originally planned to make a back rest for the stool, but material ran out for that and now I think it serves as a great storage place for the extention cord. So I’ve started a few projects in the “shop” and some are done and some are not. Rather than wait until each is done, I’ve decided to put what I’ve got so far and move on from there. The cabinet was mentioned in the previous post. It’s made of wafer-board and plywood so far. Right now it’s just a carcass with no shelves or drawers which hopefully one day it will. Eventually it will have a door for the bottom section and at least one drawer, possibly two on top. The idea here was to make use of space under the workbench which was previously not being used. 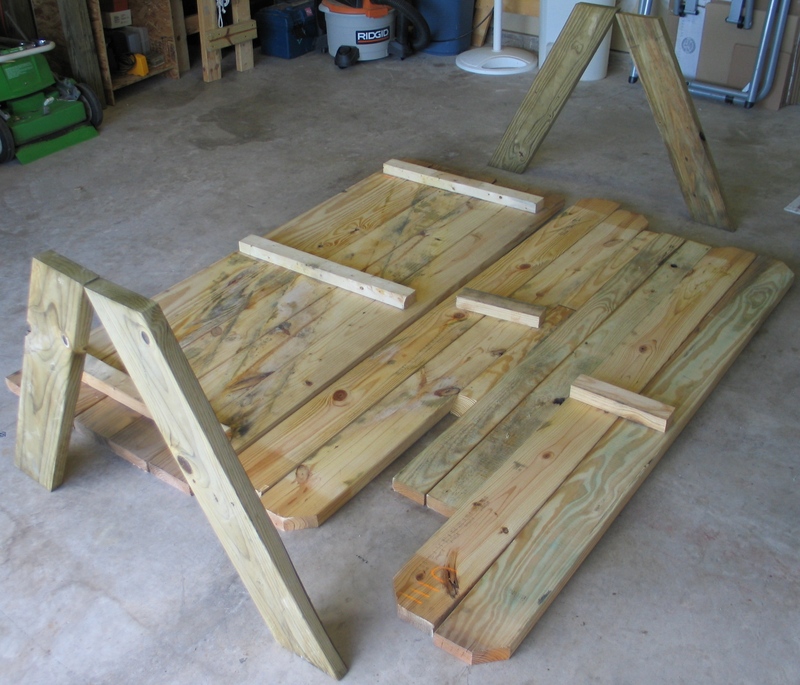 I also hope to put casters on the bottom for easy access to the top surface and mobility. As mentioned before, I only purchased the glue that went into this, and I’m trying to keep it that way. You are currently browsing the archives for the Wood Working category.